People interested in self-publishing a book. 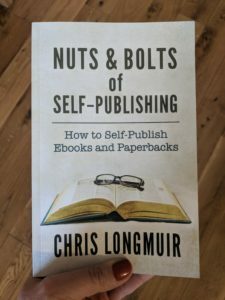 Author Chris Longmuir shares their experience in self-publishing while providing seriously detailed instructions to prospective self-publishers. I want to get my book out there. A couple of weeks ago I was texting with a friend about the book I wrote a few years ago. It’s a non-fiction advice book, focused on the relationships between people who don’t have kids (me) and people who do (damn near everyone else). I’ve put together book proposals, built a supporting website (my goal is to write multiple advice books along the same theme), and reached out to agents, but I don’t have the type of platform agents look for. In lamenting this, my friend pointed out that her sibling self-published their books. To be honest, I’d passed on this idea because I fell into the same trap that Longmuir references: self-publishing is just a vanity option for people who can’t write well. The reality is there are so many books out there, and a limited number of agents and publishers. I’m not a celebrity with a few hundred thousand followers; no one is going to make money off of me. But I like to write, and I think there is a market for the type of book I’m writing. I spent a lot of time on it (and still have editing and sensitivity reading ahead of me), and it’s silly that it’s just sitting here in Scrivener. So, I bought this book. And it is exactly what it says it is: nuts and bolts. To the point where Longmuir provides detailed step-by-step instructions not just of the process but of the actions needed. It runs the risk of getting out of date if Amazon or other self-publishing outlets dramatically change their software, but it’s going to be wonderful when I get to the point of publishing. Instead of saying “when you get to the eBook details, fill in the information”, they list out all the information you will need (and whether you have to come up with it yourself or if they is a menu of options) so you aren’t starting at a screen, scrambling for the details. Similarly, Longmuir offers warnings and suggestions based on their experience. Some publishing platforms will need to have exclusive rights unless you uncheck certain boxes. Others will provide the things you need (an ISBN) but then they are the publisher and you aren’t. Longmuir even offers a detailed breakdown of how royalties work. It’s not the most riveting read, but it’s definitely as well-written as a book on this topic could be while still being useful. I’m not ready to hit submit yet, but when I am, this is the book I’m going to rely on to get me through it. And then I hope a few of you Cannonballers will check it out.